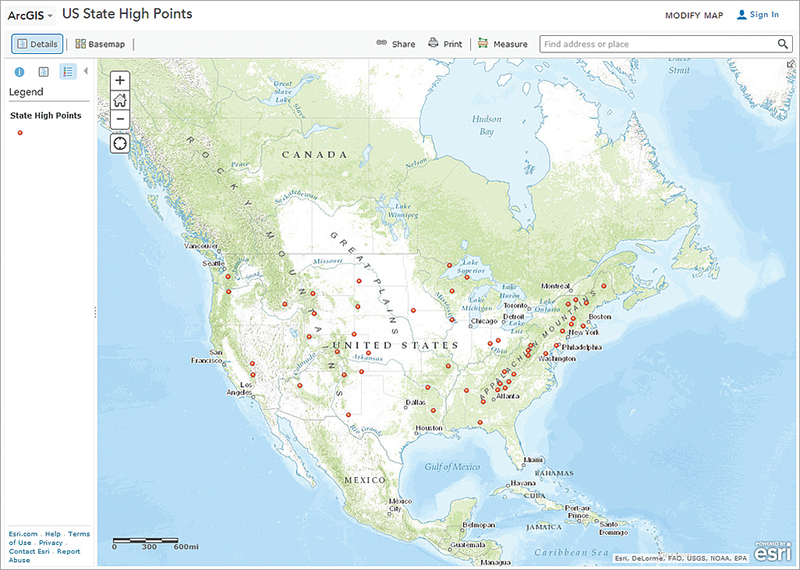 The author, David Kelley, created this ArcGIS Online map showing the locations of US county high points with latitude-longitude and elevation data provided by Tom Dunigan of the County Highpointers organization. The author created ArcGIS Online maps that two highpointer organizations use to help members and others plan trips. Highpointing is the sport of ascending to the point with the highest elevation within a given area (the "high point"). Examples include climbing the highest point of each US state, reaching the highest contours of each county within a specific state, and ascending the highest mountain on each continent. This pastime is practiced all around the world, especially in the United States. Highpointers seek to climb either to the highest point in each of the 50 US states or to the highest points in each county within a specific state. These enthusiasts trek to the summit of remarkable mountains such as Alaska's Denali or Washington's Mt. Rainier as well as less notable hilltops such as Rhode Island's Jerimoth Hill or a 10-foot (3-meter) contour in Franklin County, Florida. The heterogeneous nature of these summits is usually considered part of the appeal. The travel and cultural experiences en route to the climbs are often valued as highly as the climbs themselves. The most active highpointing organizations are the Highpointers Club (www.highpointers.org) and the County Highpointers Club (www.cohp.org). Highpointers Club members seek to summit all the US state high points. The members of the County Highpointers Club are collectively attempting to reach the highest points in all 3,143 US counties. To date, more than 240 people have completed all 50 state high points, with about 10 more people added to the list annually. Difficulty of ascent varies considerably from state to state. High points in about 20 states can be ascended by automobile, while most of the rest can be reached via an easy hike. Only a dozen or so require serious effort that can test an individual's fitness and skills. Peaks like those in Connecticut, Massachusetts, or Rhode Island are relatively easy to get to, while others in places like Alaska, Arizona, or Hawaii are distant or isolated. Cost and logistics are significant factors when planning to visit many or all of these 50 peaks. Climbers rely on current information from a variety of sources. 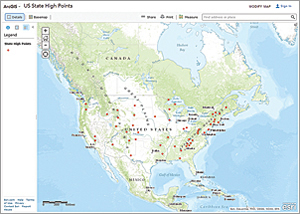 The key source for up-to-date information on state high points is the Highpointers Club, founded in 1988 to provide a forum for education about the high points, aid in the preservation and conservation of the high points and their environs, and provide members with planning tools to accomplish their climbs. The website provides a trove of valuable information about access to state high points, especially for those located on private land. One glaring omission on the Highpointers Club website was an interactive map that would let members locate and explore specific high points and the surrounding topography. The site merely provided a monochrome picture of the 50 US states with a gray star showing the relative location of each high point. Members felt that a robust and interactive map would help climbers plan better ascent routes based on terrain difficulty, identify logical parking spots and trail access points, and plot regional circuits to bag more than one peak in a multiday trip. The map would have to be customizable for the organization, easy to use, and free. The cleanest solution was to turn to Esri's ArcGIS Online. Club members wanted an interactive topographic map with cultural references, such as borders, roads, surface water bodies, and labels, that was accessible through the Highpointers website and would not require software installation or setup. ArcGIS Online fit the bill splendidly. The basemap used to develop a US State High Points map was the World Topographic Map service provided by Esri. This map includes administrative boundaries, cities, water features, physiographic features, parks, landmarks, highways, roads, railways, and airports overlaid on land-cover and shaded relief imagery. GPS coordinates for the state high points were obtained from the America's Roof website (americasroof.com) and used to create pop-up windows for each high point. Map pop-ups include the name of the high point and the state it is located in, the high point's GPS coordinates and elevation, and a link to Wikipedia for more information on the peak. The map, with its interactive functionality, was easily embedded into the main Highpointers Club web page. "It lets you zoom in to the highest detail on the topographic. There's almost no online map that will let you do it that fast or elegantly!" said Roger Rowlett, club secretary and webmaster. Initial feedback has been positive, and the map receives roughly 1,000 visits per month. County Highpointers Never Say Die! County highpointers are a different crew altogether. Rules for their accomplishments state that members have to visit all the high point contours for a county to get credit, and many counties have multiple high points. Some members have climbed more than 1,000 county high points, and some states have counties where no one has yet accomplished this goal. The base layer used to develop a US County High Points (COHP) map was compiled using the USA Topo Maps provided by Esri. These maps are seamless, scanned images of United States Geological Survey paper topographic maps with scaled detail. GPS coordinates for the high points were obtained as GPS eXchange (.gpx) files from the COHP website. Pop-up windows include the GPS coordinates, contour name, and county. COHP webmaster Adam Helman said, "This is a potentially beneficial addition to the COHP website—and so I have created a link to it from the Information Maps page, indeed, replacing the outmoded link to Pinpoint Maps, which is noninteractive and incomplete." 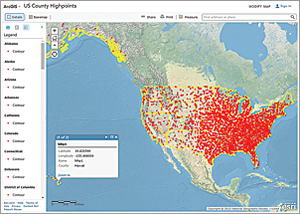 Members of both organizations can also access the US County High Points and US State High Points maps using Esri's free ArcGIS app for smartphones and tablets. For more information, contact Dr. David Kelley, Department of Geography, University of St. Thomas, St. Paul, Minnesota.